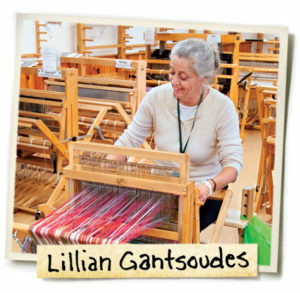 By way of introduction, Lillian Gantsoudes connects with the Folk School in many ways: she’s a student, an assistant instructor, a volunteer and a donor. She’s an integral part of our community, from producing a fundraising auction, to serving dinner at the blacksmith’s Hammer-In, to demonstrating weaving at Fall Festival. 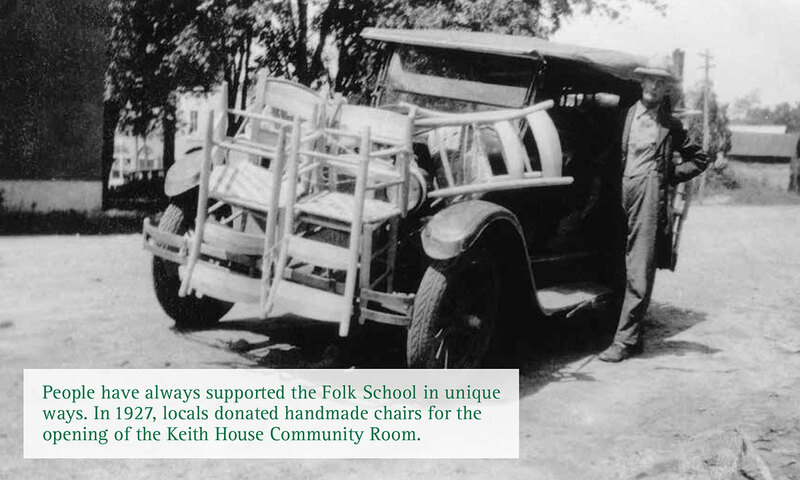 When Lillian recently decided to fund the purchase of new chairs for our beloved Community Room in Keith House, she found herself thinking about the school’s history—and about our special Folk School family. You see, when she took her first class with us in 2001, she couldn’t have imagined that the welcoming community and stimulating learning she found would eventually prompt her to move from her home in Atlanta to live full-time in Brasstown. But as she spent more and more time here, she found that “living in an embracing community, having craft as an avocation, and just the peace of being here” prompted her to call Brasstown home. So, when Lillian learned of our Fund-A-Need program, she was eager to help. This program allows folks to contribute toward purchasing important items so everyone can have their most joyful and enlivening experiences here. Lillian heard we were looking to replace the old chairs in our Community Room, and she remembered how the Brasstown community first came together to help create the Folk School in 1925, enthusiastically pledging labor, building materials and other support—including handmade chairs. Given her love for her adopted community, that idea really resonated with her. 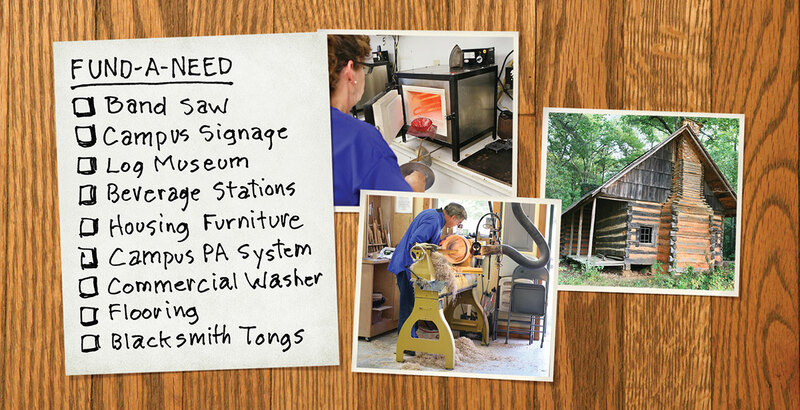 Our Fund-A-Need list represents a wide variety of necessities, from painting easels to woodcarving workbenches and from cooking studio shelving to weaving studio looms. As you know, our studios are where much of the magic happens: learning from your instructor, connecting with your classmates, and tapping into your own creative mindset. We’ve published our Fund-A-Need list at fundaneed.folkschool.org, and we invite you to see if there’s anything there that’s important to you. Maybe you’re a techie who would enjoy everyone on campus benefiting from an improved wi-fi signal. 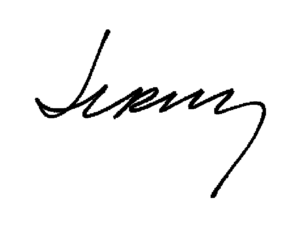 Or maybe you’re a history buff eager to help us improve our archives. There’s something for everyone on the list, and by donating to cover the cost of any item, you can become an enduring part of the Folk School, ensuring a better experience for yourself and other learners, as well. You might not live in Brasstown, but rest assured, you’re a part of our community. 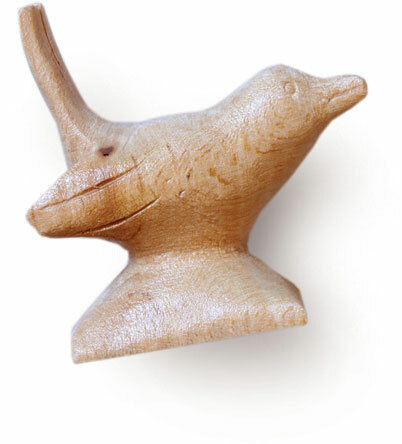 Wherever you are, you’re an essential member of our Folk School family, and your support makes all the difference. Whether you choose to donate from our Fund-A-Need list or to our annual fund with an unrestricted gift, we thank you for fostering the inspired engagement that’s such an important part of our unique Folk School experience. Hope to see you soon in Brasstown.